This one is going to be a long one folks so grab a snack and take a seat. My skincare routine is probably the most asked about question I receive regularly on my blog and different social platforms. It's no secret, I have quite the multi step regimen but after much trial and error, I have found some underlying principles and rules that keep my skin looking its best. Now I preface this post by saying that I am not an expert, doctor, or esthetician - I am simply one girl (with oily skin) staring in the mirror asking her skin to be as good as it can be. And while you can search my blog for tons of great specific product recommendations, this post will be an overall conceptual explanation for how I approach taking care of my skin. My extensive routine may not be for everyone, but this is what works for me, so remember that you can adapt some of my experience to what works for you. The kicker with my skincare system however, is my skin is constantly changing and will continue to change for the rest of my life. So the trick is trying to treat what my skin needs now, rather than trying to find the perfect recipe that will last me forever. This is a major reason why I don't use the exact same routine every single night. If I am testing out a new product, I will usually add to my routine 4 nights/week, maybe 5 for at least 4 weeks to see effectiveness. But my skin is never (ever) the same from day to day due to external factors (stress, weather, NYC, life in general), so using the exact same line up every night does not work for me. I do however, try to balance out ingredients each night, trying not to overload my skin with too much of the same thing all at once. For example when using an acid based cleanser and toner, I may finish up my routine with a soothing mask and hydrating moisturizer. Remember however, this is what works for me - and many of you may have differing opinions for your own skin. That's cool. Diverse skincare routines is what makes the world go round, baby. I have now rambled way too long, so let's get into the good stuff. Here is a look at some of my best practices for taking care of my skin, and after each category, I will list a few of my favorite products. Click on each product link for more information. 1. Cleanse - I cannot cleanse enough. And surprisingly I find that my skin does not dry out from my cleansing routine mainly because it's geared towards properly removing my makeup so not a single bit of residue remains. I always begin with a face wipe of some kind to initially help me remove the first bit of my makeup. Naturally it never gets everything off (eye makeup especially) so I always follow with a cleansing oil. Cleansing oils are my holy grail products - and a huge key to how my skin stays looking so great. Nothing breaks up makeup, dirt, grime and oil (eek, my face is disgusting, right?) like an oil based cleanser - and any amount of eye makeup I may be wearing comes off effortlessly. Finally I finish with a third type of cleanser depending on what my skin needs that evening - perhaps an acne/glycolic wash or a gentle milk rinse to make my skin feel great but never stripped. 2. Tone - Why? What? Who? How? This is exactly how I felt about toning when I began my skincare journey. And then I just dove in, did some research and tried out different types. Voila - I am now in love with toners. Typically, they are designed to remove any remaining traces of dirt/makeup, balance the pH of the skin and prepare the skin to receive the following treatments/serums/creams that will follow. Since I have oily skin that is acne prone, I tend to gravitate towards ones to help me remove bacteria so I can prevent future breakouts. But if my skin is particularly dry/irritated/sensitive that day due to who-knows-what, then I treat it accordingly. 3. Exfoliate - This step by far has made the most difference in my skin over the past two years - helping me achieve radiant and even-toned skin. I do love getting rid of those dead skin cells, but I read a great article a few months ago which mentioned too much exfoliation can have a negative effect. Eureka! That was me - I was exfoliating in some form almost every night - and multiple times over. It was a miracle I had any skin left. So I began to really look at what was in the products I was using each night, and to make sure I was not overloading my skin with peels, scrubs and then acidic based ingredients in my products. The two main types of traditional exfoliation I do regularly are chemical (peels) and manual (scrubs) - and I use each once a week, normally on Wednesday and Sunday nights. The rest of the week I may have cleansers, toners, serums, creams with exfoliating properties, but traditional peels/scrubs I save for once each a week. 4. Mask - This step for me truly embodies the notion of treating what the skin needs when it needs it. If my skin is dry that day - a hydrating mask. If I have a breakout, a pore refining mask. If my skin is dull, an exfoliating/refining mask. And a great tip that I learned from a close beauty blogging friend is that you only have to mask the part of your face that needs it. For example, the t-zone may need that clarifying clay mask, but the cheeks and forehead may be dry and need a hydrating mask. Mix it up. Don't layer the masks - just use them on the parts of the face that will benefit the most. 5. Eye cream - Many people feel that using their face cream around the eyes is a suitable treatment for this area. Like I said before, I am no expert, but I do prefer to use a product designed for the eye area as I feel it may be more sensitive to the needs of that particular skin. I liken it to using shampoo for your hair and shower gel for your body - while you can probably use one product for everything, you may not necessarily get the same results. 6. Serum - Often packed with a higher concentration of active ingredients, serums pack a serious punch when delivering results. They are usually more potent than your typical face moisturizer and are best used under a day or night cream. I have the least amount of serums in my arsenal mainly because they are the priciest of all skincare items, so I like to choose only a few that are effective for treating different conditions. Hydration is a major concern for my skin, because while its oily, it can also be dehydrated - so a moisturizing serum is always in rotation. I also love an exfoliating/retexturizing serum which really aids in brightening the skin and making it look refreshed. Lastly, I always need to have an acne treatment because I still break out after all these years - stupid hormones, ugh. 7. Moisturizer - My goodness - where to begin with this final category. This is probably the category I am the least loyal to because I am always trying something new. With that being said, I again take the "treat what you need" approach to moisturizers. If I am dry, irritated, red, broken out, dull, or feeling like I need a whole new face (kidding, but there are those days), I will reach for the cream to address the concern. Yes I have a few favorites that I can't live without, but for me, this category is forever just trial and error. You win some moisturizers, you lose some moisturizers. So there you have it folks - a more thoughtful approach as to the "whys" behind how I take care of my skin. I feel that understanding this concept is more empowering than the products themselves. Now that I know how to give my skin what it needs when it needs it, I feel more comfortable navigating all the trials and tribulations that my skin will go through over the years. Let my future wrinkles be warned. I must warn you - I might get corny here. I've been very verbal about how much you inspire me. I'm turning 25 this year and I feel older inside as I take so much care of my skin. When I was a child, I'd watch my mom slather moisturizers and oils on her face and body, which always made me curious to try them out too. I began taking proper care of my skin probably two years ago, which turned into a proper routine once I stumbled upon your instagram. Though it might seem silly, I will forever be grateful for your advice and product recommendations. I literally get so excited whenever you post something skincare related! So thank you. Than you for this detailed post! I always enjoy reading about people's skin care routines and "strategies" :) I actually just recently bought the Kiehl's Ultra Facial Cream and so far I'm absolutely loving it. Masks are the toughest category for me - I can never find one I love for longer than a few uses. Glad to hear you are loving Ultra Facial - it's a great line! I agree that masks can be a category that would constantly change if you find something new you love. I have a few that I tend to keep around but I do change it up often as well! i am so happily overwhelmed! I can't wait to try some of the mario badescu stuff... seems amazing and affordable! hi Maree - as a fellow skincare aficionado, I've just found your channel/blog and absolutely LOVE it! 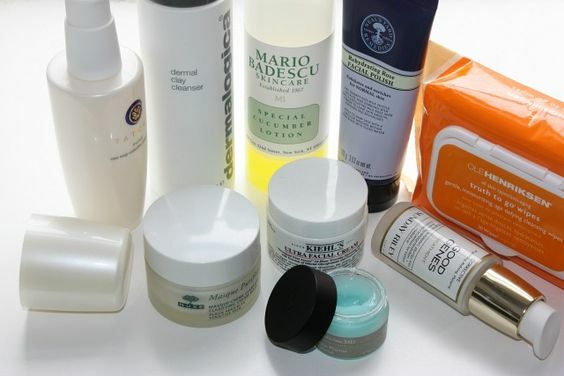 I share a similar routine, and am a huge fan of the Mario Badescu and Sunday Riley skincare ranges. Could I contact you with a few specific questions on some products/issues? YOu seem to have a wealth of hands-on experience and knowledge. Sure! My email address is alittlebitetc@gmail.com.